We are delighted to announce that on 12 September 2018 EFMD’s Director General and CEO, prof. Eric Cornuel, received the Magnolia Award and gave a closing speech on behalf of the other 49 winners. 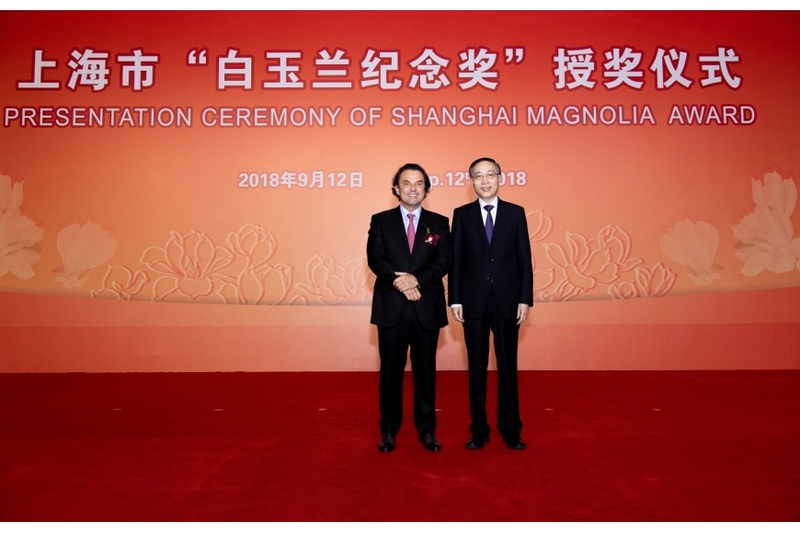 The Magnolia Award is bestowed to all those who have made significant contribution to the economic and social development of Shanghai as well as to those who have facilitated the communication and cooperation between the city and other countries and regions. It’s an unquestionable achievement for the awardees, with a little less than 1200 people having received the award since it was created in 1989. With the GDP reaching RMB 3 trillion last year, Shanghai is one of the fastest developing economies in the People’s Republic of China, being a centre of international trade, finance, smart manufacturing and technology. “Even before I became the EFMD’s CEO, I had recognised the potential of Chinese and Shanghai higher education and management development institutions, and the way they could enhance their quality through collaboration and exchange with other organisations around the world,” said Eric Cornuel in his speech. Now, 53 institutions in China are part of EFMD, which is the third largest membership among the 88 countries represented in the EFMD network, and 12 of them are located in Shanghai. EFMD’s EQUIS, which is considered to be the most rigorous global accreditation system for business schools, has accredited four schools in Shanghai. The city of Shanghai comes second just after Paris in terms of the number of EQUIS accredited schools. EFMD is the European partner in CEIBS, a 50-50 joint venture founded by the European Union and the Shanghai Municipal Government. This year, we celebrate the 15th anniversary of the Sino-European strategic partnership and the School has become a paradigm of Sino-European cooperation with its outstanding growth. Since its establishment in 1994, CEIBS has not only gained international recognition as the leading business school in China and one of the top business schools in Asia, but also contributed to making Shanghai an even more attractive place to live and work. Thanks to the Business School Impact System developed by EFMD, CEIBS has demonstrated its impact on the Shanghai region, which amounts to RMB 2 billion annual contribution to the regional economy. He continued with the recognition of the Shanghai’s municipality role in the development of the business education sector and beyond. “I am convinced that the innovative policies outlined in the Urban Master Plan towards 2035 will keep Shanghai on the trajectory of sustainable growth and make it an even more powerful example of a modern cosmopolis, strengthening its socio-economic tissue, and increasing its national and international standing,” he added. In his closing speech, Eric Cornuel also outlined some plans for the future, stressing that EFMD would continue its efforts to improve the quality of Shanghai’s management development institutions, so they can actively support the development of knowledge economy, innovation, entrepreneurship as well as effective and sustainable business solutions for the region. “EFMD will strive to promote exchange and collaboration between Shanghai and the rest of the world, especially via innovative tools such as digital education services, in order to spread good Chinese business practices and promote mutual understanding and cooperation,” he concluded. Next year, for the first time in its 46-year history, the EFMD Conference for Deans & Directors General will be held outside of Europe, and I am delighted to announce that CEIBS has been chosen as the host school as it also celebrates another milestone year and reaches 25. I would like to transmit my deepest congrats to Dr. Eric Cornuel. I wish him bigger success in future. EFMDGLOBAL is not responsible for any errors or omissions in the content of this site provided by third party or authors. The information contained in this site is provided on an “as is” basis with no guarantees of completeness, accuracy, usefulness or timeliness.